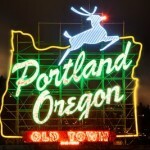 One of Portland, Oregon’s iconic locations is the White Stag sign. 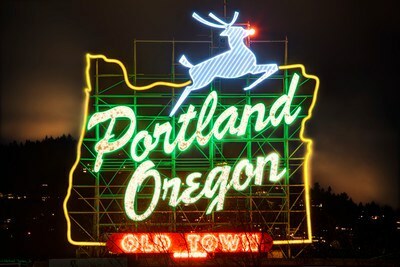 This neon sign outlined in the shape of Oregon and headed with a jumping deer has changed its written message over the years, currently reading “Portland, Oregon Old Town”, but the jumping deer has always remained. After decades of rising above the city, this sign and the jumping deer have become strongly associated with Portland and are now at the center of a trademark controversy between a local brewer and Portland City Hall. The White Stag sign came into being in the 1940s. It first read “White Satin Sugar”, advertising a brand of sugar. In 1957, the sign was changed to advertise White Stag, an apparel manufacturer that owned the building on which the sign was located. 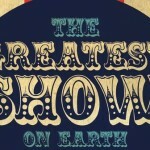 At that time, a silhouette of a white stag was added to the top of the sign. The sign changed ownership a few times in the 1990s and 2000s, until the city of Portland acquired ownership of it in 2010. The city planned to obtain trademark rights on the sign’s design to help defray the cost of operating and maintaining the sign, but this plan has hit a snag. The city registered an image of the sign as a federal trademark in several classes of goods covering things such as cyclists’ jerseys, t-shirts, tote bags, buttons, and stickers. 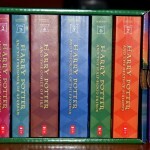 But it has not been able to register the sign for one notable category of goods – alcoholic beverages. That’s because a local brewery, Old Town Brewing, beat the city to it and registered a trademark that included the leaping white stag in 2013. Interestingly, the city has filed two separate but similar trademark applications alcoholic beverages, beer, ale, and lager. In the most recent filing, a Letter of Protest was submitted in the application in November, 2016, but an office action didn’t issue in the application until 10 months later. Unfortunately for the city, the examiner rejected the application based on a likelihood of confusion between Old Town Brewing’s mark and the city’s mark. This means that while the city has trademark registrations for the sign image in several categories, it doesn’t have a registration when it comes to beer. Interestingly, the city has been actively pursuing licensing fees to use the sign image, including from Pabst Blue Ribbon beer, since it purchased the sign in 2010. The cities licensing program may be hindered without a federal trademark registration. Adam Milne, the owner of Old Town Brewing, says he isn’t too concerned about what the city has done so far, but worries that the city may try to license the image to large, corporate brewers, which would have an impact on Old Town Brewing’s brand. So far it seems like the city and the brewery are able to coexist with their overlapping branding, but if the city pushes things, it may receive some pushback from Old Town Brewing. A case like this illustrates why having solid trademark rights to your brand is critically important. If you have questions about the trademark process, please contact a trademark attorney at Trademark Access. Let our experience protect your valuable brand.